Ideally the segment of your affection is one you ride often (and therefore see often on Strava when you upload your data). This allows you to keep a close eye on the leaderboard, to see who the “big dogs” are. In my case, the leaderboard has been fairly static at the #1 position, held by a former racing teammate of mine (John Sindell, from Garage Racing here in Seattle) who is a MUCH stronger rider than me. 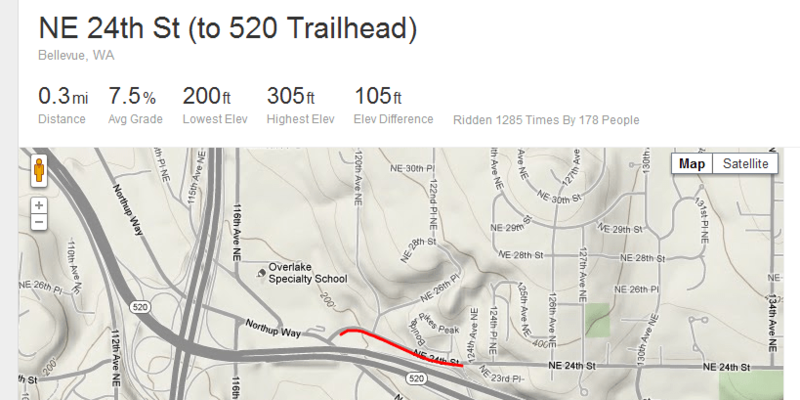 There’s been a lot of churn below that #1 slot, and as of 5/15/2012 there have been 175 individual Strava riders on that segment, and 1278 runs up that hill. 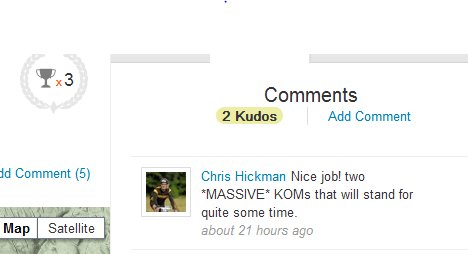 But for nearly a year, John’s held the KOM. I decided he’d had it long enough, and plotted a short term fitness peak that would allow me to potentially steal the KOM crown from him. He’s got plenty of others, he won’t mind losing one, right? 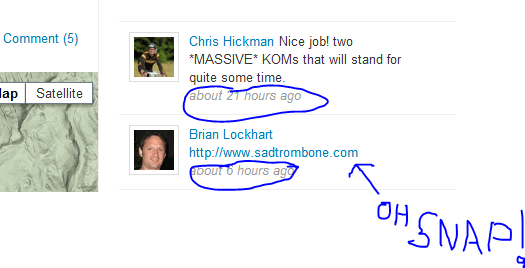 Update 7/23/2013: The fine folks at Peloton magazine (along with Specialized, BMC, SRAM, and Assos if my informercial absorption skills were in tune just now) have put together an impassioned plea and a counterattack towards a newer problem among the Strava KOM hunting community: segment whoring by professionals. Update 12/2/2016 – great article about retired pro Phil Gaimon going KOM hunting in SoCal, specifically targeting some “suspect” KOMs posted up by a ex-doper / banned rider who many suspect was on the juice when he set them.